Reigning world and Olympic champion Yuzuru Hanyu will need up to three weeks to fully recover from injuries sustained in a sickening collision with Chinese skater Yan Han during pre-free skate warmup at the Cup of China this past the weekend, the Japan Skating Federation said Monday. 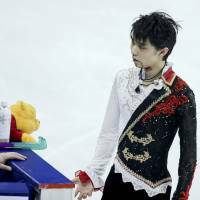 Hanyu, who returned home to Japan in a wheelchair on Sunday a day after the accident happened, was diagnosed with bruising to his head and chin and also hurt his midriff, left thigh and right leg. “I feel so sorry for all the trouble and concern I have caused but first I need to rest and get better,” Hanyu said in a JSF statement. Hanyu will see how his recovery progresses before deciding whether or not to skate at the NHK Trophy, the sixth leg of the Grand Prix Series starting at Osaka’s Namihaya Dome on Nov. 28. Hanyu was skating backward at a high speed when he collided with Yan. The clash left him on his back on the ice with blood streaming across his neck and face from a cut on his chin. 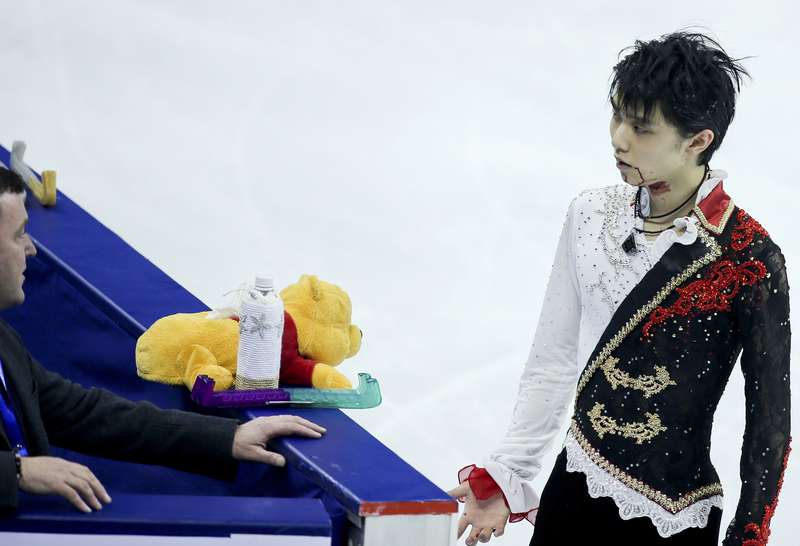 Visibly shaken and with gauze wrapped around his head, Hanyu remained in the competition and struggled through his program, falling five times. He nearly won the title anyway. Maxim Kovtun of Russia landed just enough jumps to take the gold with 243.34 points, less than six points ahead of Hanyu in second (237.55). Yan tumbled on his opening two jumps and popped his third, eventually finishing in sixth place. Hanyu’s program appeared even worse, with falls on his quad salchow and quad toeloop at the start and three more spills toward the end. He was showered with stuffed bears and flowers from the crowd and then broke down in sobs when his scores appeared, showing him in first place. Kovtun followed with his program next, skating just cleanly enough to knock him down to second. Hanyu received stitches on his head and chin and was checked for a concussion after the competition. Orser said he allowed Hanyu to compete because he wasn’t exhibiting any physical signs of a concussion after the crash — his eyes were clear and he was speaking normally, even making jokes. The crash even had an effect on Kovtun, who said he couldn’t concentrate on his own preparations and put in a flawed performance. In the ladies competition, Russian Elizaveta Tuktamysheva won her fourth event of the season, while her countrywoman Julia Lipnitskaia fell apart in her free skate and slipped to second after leading following the short program. The 16-year-old still finished second ahead of Kanako Murakami.